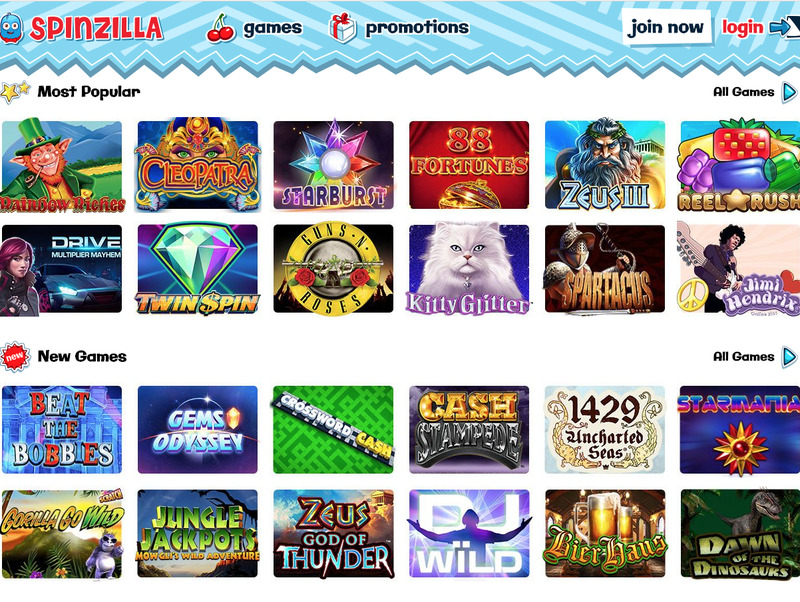 The Spinzilla online casino focuses on fun mobile and online gaming, featuring slot games, casino games and scratchcards. There are no downloads necessary to play any of the exciting games on offer, so you can play them instantly on desktop, tablet or smartphone while on the move. An amusing blue character follows you through the pages on the site, looking like he’s having the time of his life, and hopefully hinting at the hours of fun you’ll have at Spinzilla. Powered by software creator Brigend Limited, the Spinzilla online casino offers a collection of over 200 games including slots, casino games and scratchcards. You won’t need to download any software to play the slots or casino games at Spinzilla as you can start the fun right in your browser, meaning no waiting times or complicated installations before you begin. What’s even better is that there’s a select few slots such as Starburst which can be played for free in demo mode without even needing to sign up for an account, so you can try the game out before you make your first deposit. You’d be hard pushed to work your way through all of these games, but big brands such as Cleopatra, Rainbow Riches, Kitty Glitter and Ghostbusters are a great place to start. Each game has its own page giving you information on the symbols used in the game such as scatters bonus rounds you can look forward to and letting you know whether the slot games have 3 reels, 5 reels or a different playing format. Among the collection of slot games are progressive jackpot games. The jackpots of these, such as Leprechaun’s Rainbow, Treasure Fair and The Big Lebowski, are constantly increasing and can reach hundreds of thousands of pounds which makes for incredibly exciting gameplay. When it comes to casino games, there’s a nice collection of almost 20 games on offer. These include classics like baccarat, keno and European roulette, along with more updated offerings such as Deal or No Deal, Asteroids and Clash of the Titans. The scratchcard portfolio is a bit smaller with just over 10 games to play, but scratchcard offerings at online casino do tend to be quite small and games like Hollywood Stars, Dragon Scrolls and Fruit Basket are all sure to keep you entertained. Spinzilla lacks a real VIP programme, which is a shame, but you are able to collect loyalty points as you play. When you bet £2 or more you’ll earn points, which can be redeemed for bonus funds in the My Account section of the site. In this way the loyalty points system acts a bit like cashback, rewarding you for each wager you place at this online casino.